The future home of the North Albany Village grocery and liquor store in the evening sunlight Thursday. A new wrinkle in the story of the supermarket and hardware store planned for the North Albany Village shopping center: It will have a liquor store inside the grocery as well. 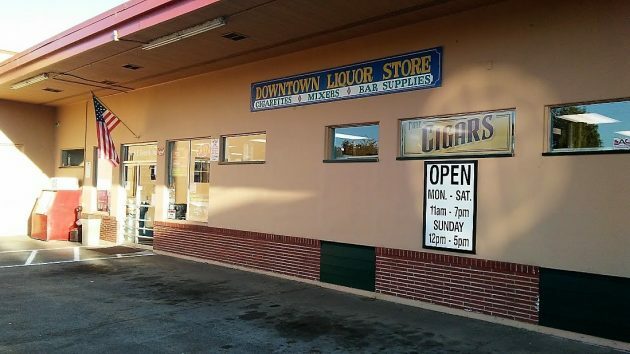 It’s the downtown liquor store that will make the move to North Albany. The OLCC approved “North Albany Supermarket LLC” as the new agent for the store. 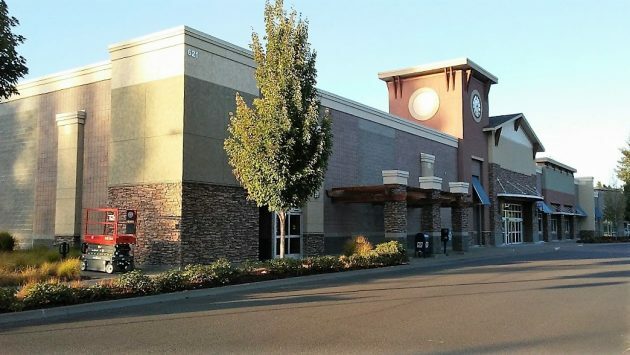 The entity, registered in Oregon in March, is part of The Myers Group of Clinton, Wash., which is working to open the supermarket. The downtown store will stay open until the supermarket is ready for it to move there, the OLCC said in a press release. I stopped by the store late Thursday and learned that Dan Powell, the agent, plans to retire. He has been operating the store for many years, the last 17 of them at the current location at the corner of Fourth Avenue and Lyon Street. Before it became a liquor store, the building housed the Greyhound bus station, a beauty shop and a cafe on the corner. No word on what happens to the building when the liquor store moves. The liquor store has been at this location at Fourth and Lyon for about 17 years. If I quit looking for construction at the store, will there be any movement? Has Myers replied to the city? Is that still the holdup? How long do we have to wait, or will the delays keep coming? When can we hope for opening? Maybe the prospect of a liquor store will motivate Myers? I watch the food channels and look forward to handy trips for ingredients. Can Myers encourage us by revealing what the departments will feature? Do you know what the name of the market will be? Since the one that used to be in Corvallis was called Roth’s IGA, and the one in Independence is called Roth’s IGA, I’m going to guess Roth’s IGA. Probably not Roth’s since that is the family name that owns the IGA’s up there (including Salem). Any word on whether or not the North Albany People Against Progress will protest the inclusion of a liquor outlet? If they don’t want apartment buildings, it’s hard to see how they’ll accept liquor sales. What’s next….a cannabis outlet? I finished drinking my lifetime allocation of alcohol almost twenty years ago, but am very happy to hear about this addition to the N. Albany store. It will bring in customers and make it a more attractive commercial venue. Well done, whoever initiated this! Kinda bummed that a downtown business is moving away. Also it is too bad that liquor store is not in the hardware store. Guess I will still have to go to Union, Oregon if I want to get hard liquor inside of a hardware store…..
Great news all the way around. Those of us living in North Albany really struggled with the lack of services and groceries, liquor, etc.… A cannabis store would be equally welcome even though I don’t personally embibe. Thanks for the update on the project, very exciting. Mega Foods should just move their location to North Albany. Turn-key independent store…. With the collapse of Mega Foods as a warning, which I believe is due in part to the arrival of WinCo, I do not believe a grocery store in North Albany will survive five years. More people than not will drive across town for cheaper groceries. I wish this were not the case, but people decide with their wallets.